One of the beautiful things about working on the internet is collaborating with people all over the world. Nowadays, productivity is not limited to having a local support staff. I currently work with a Virtual Assistant in the Philippines and an editor who lives in California. The beauty lies in our global economy and the technological disappearance of distance. The literal miles that separates me from my team in no way compromises our efficiency. However, cautionary tales of people attempting to build virtual teams are alive and real; mostly because virtual teams are difficult to manage and seem to fall apart quickly. Quick Story – A few years back, I hired a guy in India to work on a design project for me. I’d seen his portfolio and was initially impressed by his work. Here’s the kicker – his hourly rate was ridiculously low (this should have been a red flag). However, I automatically thought – this is a great deal – HIRED! I gave him the task to work on – a task I estimated would take 2 or 3 hours. When I got the design work back I wasn’t completely impressed. The work, at best, was mediocre. I was impressed, however, by the invoice that claimed he had spent 24 HOURS on the project. Unfortunately, I had no way of tracking the twenty-four hours I was being billed, nor the quality of his work. I ended up paying him more than I would have paid if I had hired someone who would’ve charged 5 times the amount but spent half the time on my project. In hindsight, I would have benefited from a reliable system of accountability. This experience helped me understand that as someone developing a legitimate business, I need the tools and resources available to businesses that interact with their staff face-to-face. And because I NEVER want to deal with the uncertainty of time tracking and poor work quality, I now use Hubstaff to better manage the day-to-day interactions with my virtual team. Hubstaff is a time tracking program that your team can install on their computers and use to track their time. Whenever your team is working on something for you, they click a button and clock in. Hubstaff then tracks time, activity levels, takes random screenshots and allows you to monitor from your Hubstaff Dashboard. You can even generate different types of reports and even send payments. When you log into your dashboard, you are greeted with a summary screen that gives you an overview of your team’s activity. You have access to total hours worked, average activity over the last 7 days, and even charts that shows the relative amount of time various people on your team have clocked over the past 7 days. You basically get an at-a-glance overview of your business activity. This next section can either be a great tool for micromanaging (if that’s what you’re into), or can be a extremely useful tool in assessing the quality of work in progress. Whenever I publish a blog post here, my virtual assistant works on graphics and layout for that post. Every so often, I want to check in and see if the layout and images she is using match the vision I have in my mind. So, I log into the Activity section and am able to view screenshots of her work. If there’s something I would like her to do differently, I can send her an instant message letting her know. It’s the virtual equivalent to stopping by her desk and taking a peek at what’s going on. This part is pretty self explanatory. Timesheets allow you to see how much time each person in your company has worked and how much you owe them. Calculations are based on the rate you set for each person. You get to determine your own payment system too. Since my main assistant is in the Philippines, I use Xoom.com which allows for direct deposits to her bank account or payments which can be sent to a physical location near to her home where she can do same day pick ups. . If you want to know the amount of time spent on a specific project, you can turn to the Reports section. I use this tool mostly for myself because I do consulting work for different companies. At the end of the month, I need to invoice those companies based on how much time I spend working for them. I track my own time through Hubstaff and then use Freshbooks to invoice them and get paid. I’ve played with different management tools available to online entrepreneurs and find Hubstaff to be comprehensive, user friendly, and recently, available for third party software integration. Trello is a project management software I use to assign tasks to my team. Hubstaff integrates with Trello so that if I assign a task to someone on my team in Trello, the task is automatically added to their Hubstaff app. When someone on my team clocks in, they can clock in on that specific task. Because this is a relatively new feature, the integration isn’t perfect yet. For example – when I add a task in Trello, it can take up to 30 minutes for it to show up in Hubstaff. However, this doesn’t negatively affect me since it usually takes a few hours before my assistant will start working on task I assign. The basic subscription level for Hubstaff is called Solo Lite and is free. 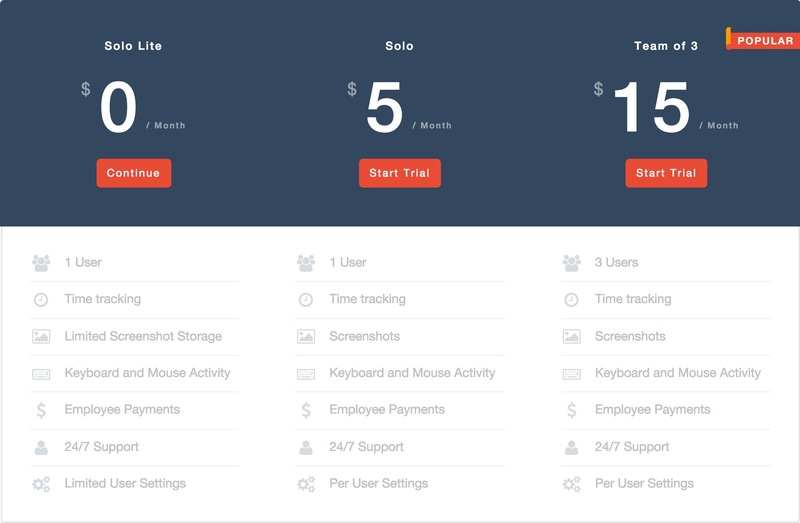 This allows for one one user on your team or can also work if you’re just using it to track your own time. There’s a $5/month version of this called the Solo plan that allows you to have more screenshot storage space and gives you greater control over the user settings. However, if you plan on using Hubstaff for a bigger team, plans start at $15/month for 3 users, and increase depending on the number of people on your team. There is one element of Hubstaff that I don’t like. Once you’ve set up projects and tasks in your project management system, there’s really no way to change those tasks on the time tracking app itself. You have to log back into your project management system (i.e. 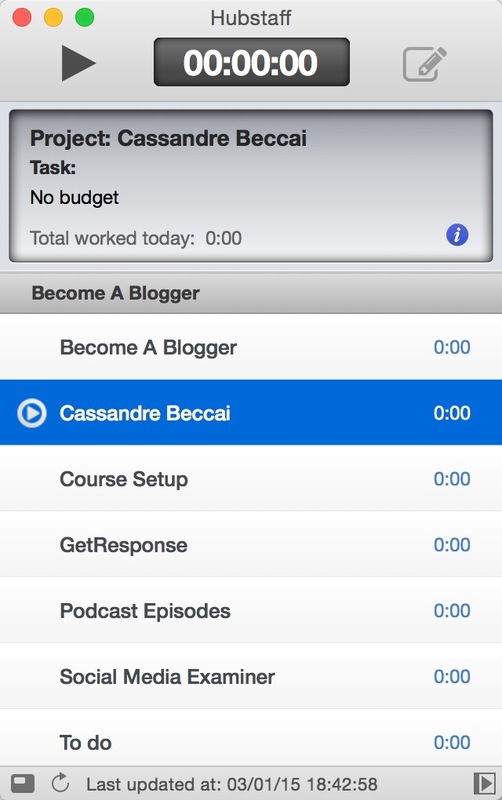 Trello) or the web version of Hubstaff to modify those tasks. It would be great if my assistant were able to simply log into the app and make adjustments to what she’s working on based on what she sees fit. In some ways, this gives you more control, but quite frankly – it’s control that I don’t see myself needing. 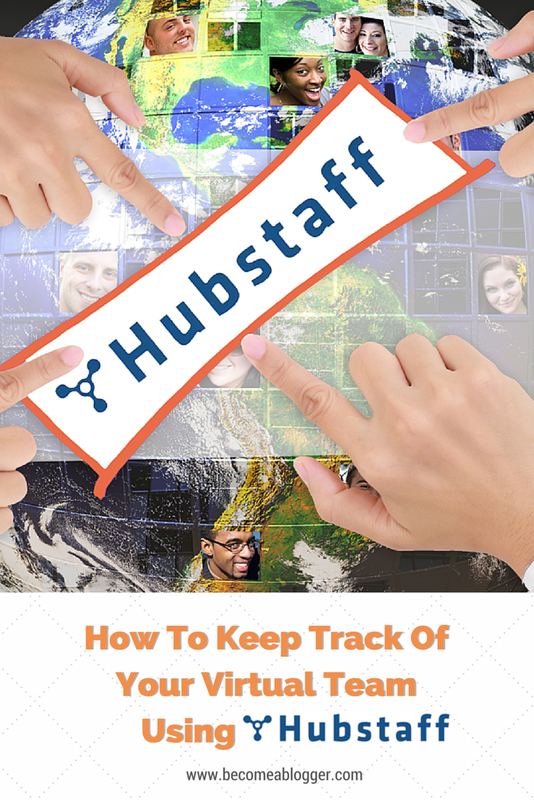 When it comes to tracking the time and productivity of your team, Hubstaff is an awesome tool. I’ve been using it since the beginning of the year and it has made my virtual team much more efficient. If you’re building a team and want to make sure that you are tracking your team’s progress, I highly recommend Hubstaff. If you’d like to check this tool out and see if it’s right for you, try them out for free for 14 days. Do you have a team or are you a “solopreneur”? If you do have a team, what software do you use for tracking their productivity? Let's chat about it in the comments area below. 1. You always get what you pay for. 2. You can have something done Fast, Accurate or Cheap–but not all 3 together. 3. Never accept the lowest bid, see rules 1 & 2. I’m having a hard time understanding the relevance of this comment to the post. Can you explain? Hi Leslie – Just a quick note to say thank you for taking the time to create this review. I run Hubstaff – If anyone has questions, I’d be happy to answer them here.